Happy Birthday, You Servetus Killer! One cannot hold to Reformed Theology (Calvinism) without having heard someone say, “Calvin was a murderer who had Servetus burned at the stake!” It’s a common objection to the theological views known as Calvinism. For years, I was under the impression that John Calvin was directly responsible for the death of the heretic known as Servetus. The image that was painted before me was that Calvin, the mean-spirited Reformer, jumped at the opportunity to burn someone who was teaching heresy. However, there are significant problems with this over-simplification… namely that it is 100% incorrect. 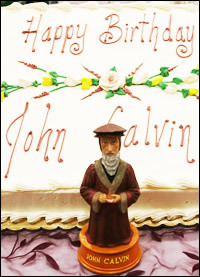 Since today is John Calvin’s birthday (he’s 504 years old), I wanted to direct you readers to a short essay that you might find helpful in thinking through Calvin’s involvement with Servetus. It is but a short introduction to the subject, but makes some very important “discoveries” that need to become familiar to those who use this “objection.” Say what you may about Calvinistic theology, but leave Servetus out of your arguments! Servetus shouldn’t have been killed. But it’s unhistorical to suggest that Calvin killed him. Plus, when you find out that Calvin had actually had a lot of pastoral interaction with Servetus, it sure frames the issue much more!